One of our clients operates sites that must comply with local environmental legislation that requires, amongst other things, any releases of waste, contaminants or potential contaminants above threshold levels to be reported promptly to the regulator. The regulator also conducts inspections. Several small releases had resulted in the regulator imposing minor penalties. The company wanted to examine the root causes for a selection of incidents, with the aim of identifying general lessons from them and specifying areas in which the business could improve its performance. The details of the individual incidents were of limited interest in themselves as in each case remedial actions had been undertaken on site, but they were of interest as pointers to longer-term company-wide issues. Broadleaf facilitated a process to focus on the lessons that could be learned from them to allow the company to address broader organisational and procedural matters rather than incident-specific ones. 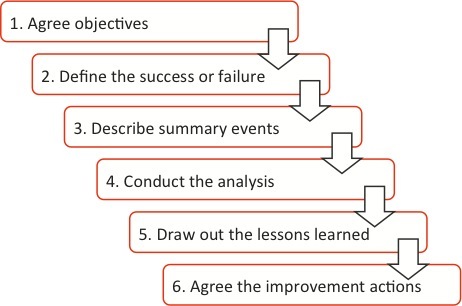 The steps in a simple root cause analysis process for examining a success or a failure are outlined in Figure 1. The steps were modified slightly for this case. Develop recommendations for actions that would lead to broad improvement across the company, with benefits across all sites and not just those that were studied here. In all, we examined six specific incidents, of which three were representative of similar incidents that had occurred at other sites. All involved minor releases of liquids, all had been discovered and rectified quickly without significant environmental impacts, and all had been reported to the regulator. Two had been the subject of Regulatory Notices of Infringement with associated minor penalties. The people who were involved in the process are listed in Table 1. Equipment details, including technical descriptions, incident histories and inspection and maintenance records. Documentary information was supplemented by site inspections and discussions with the people involved. The intent of the review and the discussions was to document facts, with a focus on what had occurred, where and when. Opinions about why something might have happened, people’s views on possible causes for each incident, were omitted – the agreed causes would emerge later from the analysis. Facts included in the timeline included such things as observations, inspections, repairs, specific weather events and communications with stakeholders. Other facts that were not time-related, such as topography, were recorded separately. The source of the information or the evidence provided. The timelines provided the basis for developing simple cause-effect trees, one for each incident. These trees were focussed on the specific incidents and the specific sites. Figure 2 shows the cause-effect tree for one of the incidents, simplified slightly for this case study. This tree related to an overflow of water from an irrigation area to a creek during heavy rain. This was a reportable incident because some of the water in the irrigation area came from a dam used to store grey water – water discharged from the site camp’s sewage treatment plant (STP). Broadleaf facilitated a workshop to analyse each of the six specific incidents. The cause-effect trees and the annotated timelines formed the information base from which the discussions and analyses proceeded. From the initial information, and wider discussions about each specific incident and similar ones, a set of lessons was extracted and associated actions were recorded. Table 2 shows selected lessons and actions that related to the irrigation area incident described above. People forget the small details, so important information about root causes may be omitted. People rationalise what happened, or what they think happened, and this distorts their perceptions – they develop hypotheses about why the incident occurred, they selectively ‘lose’ or forget information that does not fit into their hypotheses, and they may generate false memories to fill in the gaps in their knowledge, all forms of confirmation bias. A full understanding of the context for an incident can only be gained by seeing the place where it occurred. It is better to interview people on site, and get them to show you what happened and where. Visits and photographs provide the basis for a sound interpretation of documentary evidence. The focus of the initial analysis should be on what, where and when the incident occurred and who was involved. It is important that the question of why the incident occurred, the causes, not be addressed, even though it might be tempting, as this can lead to the kinds of confirmation bias noted above – information that does not ‘fit’ with the hypothesis about why may be ignored or given lesser weight. It is useful to organise information in a clear timeline, as this provides a simple and transparent data structure. It also forms a useful base for developing cause-effect trees, as causes occur before any related effects. Such an approach also captures information before an event that at the time may not seem relevant but later, during the analysis may prove to be a precursor or a root cause to the event. Similarly, capturing information on a time line after the event allows the analysis to examine the post-event response and to learn lessons on how that could be improved in future. Cause-effect trees provide simple representations of facts that are excellent for communicating, and they make it easier to spot gaps and inconsistencies. Even if they are incomplete, they provide a good starting point for a workshop because they set the scene well. They show the sequence of pre- and post-incident actions and decisions in a logical order. Separating each node into a pre-existing situation and an action that caused it allows the analysis to quickly focus on the root causes. These are the points at which further analysis is not worthwhile. Developing detailed timelines and initial cause-effect trees takes some effort, but we find that preparatory work of this kind pays off. We include it in briefing material for workshop participants, so they have an opportunity to check facts in advance, collect more information if appropriate and engage with the incident and the root cause analysis process. The purpose of root cause analysis of the kind described here is to learn lessons and take actions to prevent further failures and repeat successes. This requires positive action, as organisations don’t usually learn lessons naturally. The actions should relate to the root causes. Like all actions, they should be specific and agreed, and clear responsibilities should be allocated. They should be recorded in the organisation’s action tracking system, with regular status reports. Actions should also focus on how the lessons learned from one incident and its root causes can be communicated across the organisation. Procedures and guidelines provide a common way of capturing and codifying the lessons so the benefits are widespread and enduring. Root cause analyses generate information about the existing controls (or lack of them) and their effectiveness. This may require risks to be re-assessed and risk registers to be updated to incorporate the new information and lessons. The actions that arise from root cause analysis are risk treatments in that they will lead to new or improved controls.